But the best bit is her recollection of the incident that earned her a criminal record for her assault on toilet attendant Sophie Amoj Amogbokpa. For her crime of assault occasioning actual bodily harm, Cole got 120 hours of unpaid community service, an order to pay her victim £500 compensation and pay £3,500 of prosecution costs. Amogbokpa worked at the Drink nightclub in Guildford, Surrey. Cole hit Amogbokpa on 11 January 2003. We saw the victim’s face (see above). 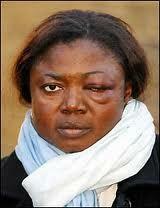 Cheryl Tweedy, as was then her name, was cleared of racially aggravated assault. Before I knew it, I was lashing out at Ashley in every way I possibly could. I hit him in the face — I couldn’t help it. I was shaking him, kicking him, scratching his face, pushing and shoving him like I was a lunatic, and he just took it as it was obvious I’d gone crazy.